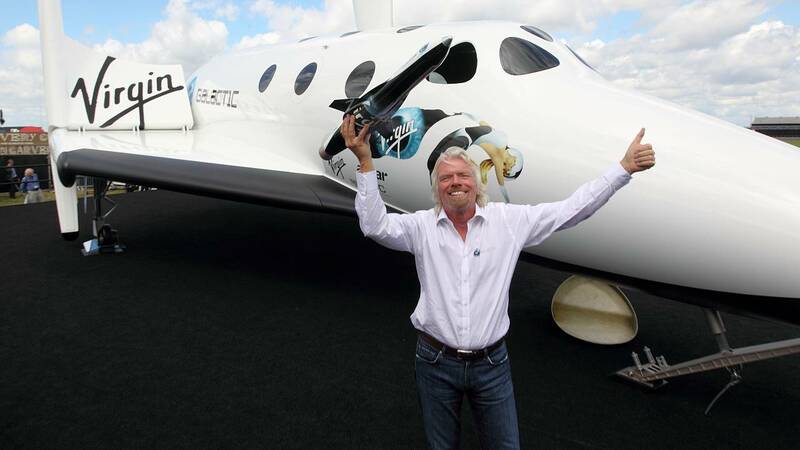 Virgin Galactic CEO Richard Branson has long claimed that one day he would ride into space aboard his company's spaceplane, and now he knows when. The British billionaire said Thursday that he plans to take his first trip to space within the next six months — the flight will coincide with the anniversary of the first landing of astronauts on the moon, one of spaceflight's greatest achievements. "My wish is to go up on the 50th anniversary of the moon landing, that's what we're working on," he told AFP during an event at the National Air and Space Museum in Washington, D.C. The first moon landing occurred on July 20, 1969, when Apollo 11 astronauts Neil Armstrong and Buzz Aldrin set their lander down on the lunar surface. Branson's remarks come two months after the most recent test of the company's SpaceShipTwo spaceplane, in which a pair of pilots flew the craft to an altitude of 51 miles above California's Mojave Desert before landing safely. Most experts agree that space begins at the Karman line, an imaginary boundary at the far edge of Earth's atmosphere some 62 miles above average sea level. "I'm itching to go," Branson told CBS News after that successful test. The December test flight was one of a series of four so far for Virgin Galactic's spaceplane, including a disastrous October 2014 test during which the craft broke up in flight. The crash killed one crew member and seriously injured another. Despite the accident, Virgin Galactic says hundreds of customers have signed up for a brief suborbital flight into space. A ticket to ride costs $250,000. But will the company be ready in time to meet Branson's ambitious timetable? "I need to wait for our team to say they're 100 percent happy," he told AFP. "I don't want to push them." "I think they are ready," Richard Garriott, a video game developer who in 2008 spent $30 million to spend 12 days orbiting Earth as a private astronaut, told NBC News MACH in an email. "They will likely have a few more test flights between now and then, but they are basically ready now by publicly available measures." Virgin Galactic isn't the only company working to indulge the dreams of wannabe astronauts. SpaceX CEO Elon Musk said in September that the company would fly a Japanese billionaire around the moon aboard its Big Falcon spaceship in 2023. And Jeff Bezos' rocket company, Blue Origin, plans to charge customers $200,000 to $300,000 for brief suborbital flights aboard its New Shepard spacecraft sometime this year. Garriott said Virgin Galactic and Blue Origin likely would have plenty of customers for years to come. "The real question is sustainability after the first few hundreds of flyers," he added. "I do have price elasticity concerns once the price becomes multiples of hundreds of thousands."